My path to pregnancy was a difficult one, winding through four years of fertility treatments, a lot of hope and disappointment, and on more than a few occasions, physical pain. Once I became pregnant and it was clear the baby was going to stay, I was surprised by how disconnected I felt from the little being growing inside me. I had worked so hard for this! Where was that blissful joy I was expecting to feel? 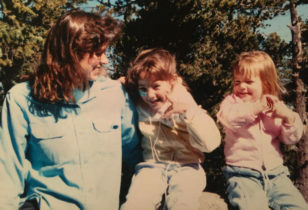 I had become so afraid of disappointment that I was having trouble feeling grounded in my body or connected to my baby. I realized that I was experiencing what might be called “PFTSD,” post fertility treatment stress disorder. And while I don’t believe I had an actual disorder, I was certainly traumatized and a bit numb. 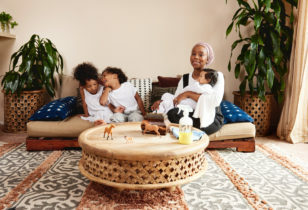 Now, as I move through my second trimester, I have found a few things that are critical to strengthening the joyful presence and connection I want to share with my child. Sleep. It’s very difficult to be present for anything when I haven’t had a good night’s sleep. There are a few general things that support restful sleep, like exercising at least 30 minutes a day or going to bed and waking up at the same time. It also really helps to make time at the end of the day to practice meditation, yoga, or breathing exercises. This simple technique will help to soothe your nervous system. All you have to do is breathe in for a count of four, hold your breath for a count of seven, and breathe out for a count of eight. After breathing like this in bed for a few minutes, I relax right into sleep. Falling Asleep Meditation: This guided meditation is one of my favorite free meditations in the Stop, Breathe & Think app. It involves imagining that your entire body is made of light, and that each cell is filled with light, warmth, and a sense of peace. Then you imagine that you bring this sense of warmth and peace as you ease into sleep. Gentle Yoga. Frequently it’s back pain and poor circulation that interfere with my ability to fall and stay asleep, and that’s when I turn to these three yoga poses. Leg Lifts: For improved circulation, stand in front of a wall with your arms straight in front of you and palms on the wall. Lift up to the balls of your feet, heels as high off the ground as you can manage, and squeezing the muscles in your calves, thighs, and buttocks, and then lowering back to the ground. I started with 25 repetitions, and have now built up to 50. Child’s Pose: For back pain, begin on all fours. Bring the big toes together and knees wider than the hips. Push the hips back towards the heels while keeping the arms extended forward. Rest the forehead on the ground. Soften the shoulders, and relax the arms. With every inhale, breath into the back of the torso. On every exhale, allow the body to relax and sink into the pose more and more. Child’s pose is a restorative, grounding pose that also stretches out the spine and sides of the body. It activates the parasympathetic nervous system and facilitates a sense of calm. Cat Cow Pose: Begin on all fours. Shoulders over the wrists, spreading the fingers wide. Hips over the knees, knees hip-width apart. Cow: Inhale, lift the tailbone and chest up toward the sky, sinking the belly towards the ground. Relax shoulders away from the ears and soften the gaze. Cat: Exhale, round the spine toward the sky as the hands and legs push firmly into the ground. Release the head and tailbone toward the floor. Breathe slowly (I breathe to a count of 4 for each inhale and exhale), allowing the breath to flow with the motion of the spine. Inhaling into cow opens the heart, stretching the torso and the neck, while exhaling expands the back and stretches the spine. These poses bring the attention to the breath, anchoring the mind into the present moment, and calming worry. Breathing and Meditation Exercises. Sometimes I approach these exercises as a formal meditation session, but now that I’m familiar with the techniques I can do them almost anywhere. For example, in the car, waiting in line, or walking from one place to another. · Find a comfortable seat, on a chair or cushion, with a relaxed and upright posture. · It can be helpful to sit on an additional cushion so that your backside is lifted, which you may find helps you to feel more open and relaxed. · Place one hand just below your belly button. Place the other on top of your belly button, or in your lap. · Take a few deep breaths. While you are breathing deeply, relax your shoulders, your stomach muscles, the muscles in your face and your hands, and your legs. Let go of all the tension in your body. · Inhale slowly through your nose into your belly, feeling your belly expand. When you have inhaled as deeply as is comfortable, slowly exhale through your mouth letting your belly relax as it releases the air. · Maintain a relaxed and slow pace that feels natural to you, for as long as you like. Get Out And Smell The Roses: When I need to slow down and clear my head, I’ll go for a mindful walk. Several studies have shown that taking a break to be in nature can have a rejuvenating effect on the brain, and can make you happier. A mindful walk engages all of your senses—sight, hearing, smell, taste, and touch—to bring your awareness to your body and surroundings and ground yourself in the present. I love the Appreciation Walk I recorded for Stop, Breathe & Think. While it’s a bit weird to hear the sound of my own voice, I listen to it all the time while I walk. Connect With Your Heart: Another favorite is meditating on kindness, which can help you feel happier, more connected, and even strengthen your heart. One of the greatest things you can give yourself and your growing child is the gift of kind, attentive presence, and this meditation can help you cultivate it. Give Yourself A Little Compassion and Understanding: My last go-to practice, called Hand to Heart, is an excellent way to calm stress, release oxytocin (the “love hormone”), and soothe difficult emotions. It’s a simple but effective practice that involves placing your hand on your heart, allowing your breath to be natural and relaxed, and feeling the sensations there with a sense of kindness and understanding. Keep in mind that while trying these meditations, it can be challenging to generate positive feelings like joy or kindness on the spot. That’s normal, and it’s okay! When it happens to me, I just notice how I feel, and make the wish to feel those positive feelings. Be confident that over time, the positive feelings will grow. If you can regard yourself and the process with warmth and friendliness, you can have an enormously positive impact on your health and wellbeing, as well as your child’s.